One of the exciting new games we announced at E3 was the return of the wildly popular “Zoo Tycoon” series. For the first time on consoles, this newest chapter of the famous franchise will be available on both Xbox One and Xbox 360 later this fall. Microsoft Studios and Frontier Development are working hard to ensure that fans of the series feel right at home and have an authentic “Zoo Tycoon” experience, while providing new and exciting features that are only possible on the Xbox platforms. “Zoo Tycoon” is being developed by Frontier Developments – the studio behind “Kinectimals” and “Kinect: Disneyland Adventures.” We recently had the opportunity to have an in-depth chat with Jorg Neumann, Studio Manager with Microsoft Studios, about the latest developments. Tell us more about “Zoo Tycoon” for Xbox One and Xbox 360. Jorg Neumann: “Zoo Tycoon” is a celebrated franchise with a tremendous and passionate fan base that deeply cares about this premier animal tycoon experience. We knew from the outset that it was critically important to retain the magic of “Zoo Tycoon.” We feel a great sense of responsibility to the fans and are incorporating the excellent feedback and suggestions we’ve received from them over the years. By bringing the franchise to the Xbox consoles, we are able to add awesome new gameplay experiences and groundbreaking social dimensions that will make this the best “Zoo Tycoon” experience ever. We’ve heard numerous times that players want a “Tycoon” experience that is designed from the ground up for the consoles. At the top of everyone’s list is the desire to make the creation of highly personalized zoos more intuitive and easier, while maintaining a high degree of creative freedom and self-expression. It’s amazing to see just how much Frontier has succeeded and how easy it is to create the zoo of your dreams. The second most sought after feature by fans is the desire for a greater connection to the animals they care for. 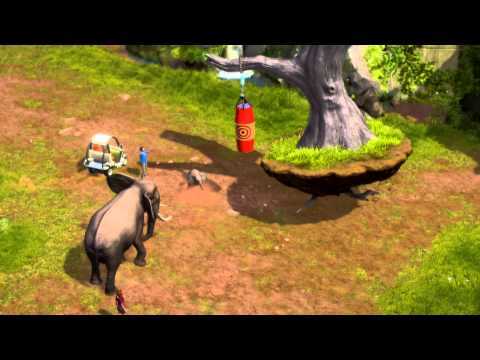 I believe players will be very excited to see how we’ve integrated Kinect into the experience to deliver a whole new dimension of interaction in “Zoo Tycoon.” There is something special, almost magical when you have animals that recognize you, your voice, and that react to your movements and instructions. Another area fans really wanted us to focus and innovate on for the new “Zoo Tycoon” is the social experience. Xbox Live backed by the cloud is the perfect platform for this ambition. We absolutely love the idea of building and maintaining the zoo of your dreams together with friends. What does this mean for gameplay? You can upload your zoo to the cloud, share it with your friends, and have up to 4 players simultaneously contribute to the creation and maintenance of a zoo at any one time. Collaboration is a key part of this new “Zoo Tycoon” and we believe it will open up the experience on a truly global scale. Xbox Live really is the key to establishing what will be the first worldwide community of “Zoo Tycoons.” For the first time, players from around the globe can share their zoos, communicate with other Tycoons directly via Skype, loan and trade animals with each other and engage in large scale community-wide conservation efforts. Players will be able to come together and work on achieving a goal related to the care and support of these amazing animals. Not only will they receive special awards for their participation, but we intend to also support related real-world conservation efforts, which I’ll talk about later. These are just some of the new groundbreaking experiences that we can bring to “Zoo Tycoon” via the power of Xbox, Live, Kinect and the cloud. We can finally deliver the gameplay vision we’ve always wanted to bring to the console platforms and create the best “Zoo Tycoon” experience ever. Jorg Neumann: “Zoo Tycoon 2” is the perfect reference for our game because it allows us to look at what made this fantastic franchise so popular and to look at how we can learn from the previous titles in the series. We aim to pay homage to what has gone before while enhancing the core experience. New features which utilize the power of Xbox One will enable the best console experience for our consumers, with the most accessible, collaborative and stunning “Zoo Tycoon” game in the series. We feel a great responsibility to the fans of the series and it’s important to us that we retain the magic of “Zoo Tycoon” while delivering on gameplay that is in large part formed with the feedback we’ve received from players. Construction and the “Tycoon” aspect of the game are incredibly important to the franchise and game as a whole. Certainly there was some temptation to simply reuse both systems from the PC series, however we identified a need and opportunity to develop a system that plays to the strengths of the console experience. We have dedicated a lot of time and effort to offering players accessible, intuitive systems that work well on a console controller and interface, balanced with the greatest level of depth possible. After all, the best gameplay is often found in balance and I believe players will appreciate the improvement to gameplay by optimizing these systems. “Zoo Tycoon” fans will find themselves at home with the core game loop and key mechanics, while new players will find they can instantly grasp the core game and get hands on creating their zoos due to the improved accessibility. In addition to optimizing the existing systems, we are bringing a lot of really cool new features to the “Zoo Tycoon” Franchise. The animals are the core part of our “Zoo Tycoon” franchise. So we are making sure we create the most beautifully rendered animals, animated to capture the essence of what you’d experience when at a real zoo. The player can get up close to our stunning animals by switching to the animal camera that focuses in on the selected animal to give the player the truly staggering amount of detail going into these models which makes them look as realistic as possible. They can also get close to the animals through the enrichment interactions that utilizes Kinect on Xbox One to create a level of interaction between players and their favorite animals which wasn’t possible before. Combining natural gestures to interact directly with your animals via charming enrichment interactions and intuitive voice commands to access menus and infographics in the most intuitive way possible. We are bringing a level of immersion never before seen in a “Tycoon” game and it’s all possible due to the power of Kinect on Xbox One. Another new feature we are super excited about is the animal conservation and preservation component within the game. There will be a great deal of focus on captive breeding and saving/rehabilitating and releasing animals back into the wild once they’re ready. Once released into the wild, the player can keep tabs on each animal to see how they’re progressing and adapting to their new home. That desire to support the conservation and care of these animals is at the core of our community challenges. We love the idea of bringing gamers together and putting that collective passion towards the education about and conservation of the very animals that make this type of game possible. For example, we are delivering in-game updates based on real world events that raise player awareness regarding the animals they love. These real world events, made possible by our strong partnerships with great companies like the Association of Zoos and Aquariums, are turned into in-game challenges. For example, if certain challenges are successfully completed by the “Zoo Tycoon” community of players, Microsoft has committed to donating resources to help assist the preservation of these animals. We love the idea of dedicated people making games for passionate players who in turn have a positive real world impact on the animals that make this franchise possible. Education is also an important part of our franchise and players will be happy to know that each exhibit will have a plaque attached to it containing all the important information relevant to the animals in that exhibit. We feel strongly about educating players to drive awareness of the state of these animals in the real world. Hopefully we will inspire players to look into conservation efforts or support one of the many good animal conservation causes out there. As with all games in the “Zoo Tycoon” franchise, satisfying the needs of the animals is still at the core of the experience, while trying to balance that against the needs of your guests. Fans of the “Zoo Tycoon” franchise will appreciate the improvements while still feeling a strong sense of familiarity. We’ve also improved on the original Campaign mode by adding in an adaptive challenge system which will help the players expand and maintain their zoo while throwing in a few curve balls to keep the player on their toes. We also have more of a focus on getting down into the park and running around amongst the guests, although the player who wants to stick to Tycoon mode and fly around up in the sky can still do so. While running around the zoo the player will be able to see their guest’s needs as they’ll play specific animations to show how they’re feeling. The player will also have to do other little jobs such as cleaning up litter to keep the park clean, cleaning out the animal exhibits and delivering food stock to concessions to stop them from running out. We have also added in a buggy to allow the player to travel around their park much quicker than running around, it handles really well and is a fun addition to the game. What’s it like to work with Frontier again? Jorg Neumann: What people may not realize is that we’ve never stopped. We’ve been working with Frontier continuously for over six years now. We initially started on a zoo-related concept back in 2008, but ultimately decided to put that project on hold in order to focus on an experience that was based on a deep and emotionally meaningful connection between the player and one single animal. That experience, “Kinectimals”, launched with Kinect in 2010 and is now one of Microsoft’s most successful franchises. After the success of Kinectimals, and the follow-up “Kinectimals: Now with Bears” in 2011, we had the once-in-a-lifetime opportunity to work with the world-class people at Disney Interactive and the famous Imagineers at Disney who are responsible for Disneyland in California. We had a wonderful experience recreating the magic of Disneyland in the form of “Kinect: Disneyland Adventures”, which was released for Christmas 2011. After that, we started working on “Zoo Tycoon” again and focused the development on fully embracing and utilizing the features of Xbox One and Xbox 360. We have a wonderful and very collaborative relationship with Frontier that has already yielded three excellent and charming console games and we can’t wait to bring this new and re-imagined version of “Zoo Tycoon” in glorious HD to the fans out there! Jorg Neumann: Very soon! As you could see from our E3 teaser trailer, the game is coming along well and it’s going to be the best “Zoo Tycoon” title to date. We are planning to have a fully playable version at GamesCom in Cologne, August 21-25. For those who can’t make it to Cologne, the game will be available for everyone for Holiday 2013.